For this has been a truly lazy Sunday after a long time, I almost did not post anything. But then old habits die hard. So for this lazy Sunday I present the Haew Suwat Waterfall from Khaoyai, Thailand. Khaoyai National Park is a beautiful lush green area. You can take your own car inside the park. I am not sure if you can take them on the trails though. We pretty much stayed in the main area and didn’t take the detours. But we did take the park vehicle in the evening to go on a night trail! There are steps leading down to the waterfall and swimming is prohibited in the natural pool. It was good to sit down, take off my shoes and put my feet in water. 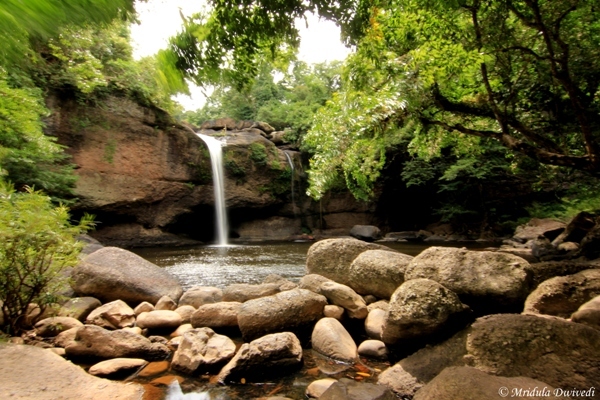 This waterfall is inside the Khaoyai National Park, about two and a half hours from Bangkok. It was quite popular with the locals. There were many people at the waterfall enjoying the scenic view. I was quite excited about the night safari in the park. We were standing at the back of an open vehicle and started on our safari. The weather looked ominous and I was quite worried about my camera. I asked around and secured a poly bog, just in case it rained. And rain it did! It literally poured down like anything. The front of the vehicle had a cabin and it suddenly became a very attractive place for everyone. I passed on my camera inside quickly but I was not too keen to go in. But as our guide was a lady and she too would not go in as a courtesy I gave up after 5 minutes. Once inside the cabin I realized how cold it was actually to stand in that tropical downpour even for five minutes. My teeth were chattering all the time! Our guide probably saved me from getting a nasty cold!